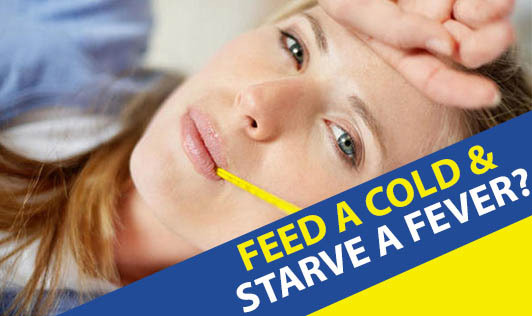 Feed A Cold & Starve A Fever? A common proverb is 'feed a cold and starve a fever'. Is this true? No. If you starve a person suffering from fever, chances are that the person will be totally weak and will take longer to get back to normal routine after recovery. So feed both cold and fever with healthy foods and plenty of warm, healthy fluids, unless otherwise medically indicated.